As we draw closer to the end of one chapter in life, and we can already anticipate the turning of the page, to year 2012, many of you are already feeling the anxiety of another year. Or, if you aren’t feeling it yet, it will creep up on you soon enough. In this new series of short articles (my New Years resolution), I will point out some tools and techniques, religion offers to deal with this and other very real life issues. There is a strong connection between anxiety disorders and certain common personality traits. G-d created everyone with what’s called in mysticism, an animal soul. Everyone’s got it. This source of life energy, propels the negative feelings and anxieties in our lives. They must absolutely be addressed if you want long-term freedom from anxiety symptoms. Excessive need for control. Perfectionism. Extreme cautiousness . Excessive need for approval. Insecurity and over-dependency and a tendency to suppress negative feelings. These are some of the traits that are common in people with high anxiety. Our sages tell us, “Half the cure, is knowing the sickness.” Without recognizing the anxiety producing parts of your personality and learning to approach life from a different perspective, you may end up suffering with anxiety symptoms forever, locked up in a constricted world of your own doing, when freedom is possible. There are a number of psychological and emotional personalities that are in common in the above list of onsets to anxiety, I will deal with one, and that is, an unrealistic and disproportionate sense of ego. The world we live in dictates through the many forms of media, that a smart, strong human being, must have the answers to everything. There is a how to, and a six or maybe even seven or eight step solution to every difficulty. Whenever we are faced with problems, it’s either entirely our fault or we are totally responsible for fixing the total mess. King Solomon, the smartest of all men tells us, “It is not to the wise bread.” Bread and success does not come because a person is wise. “Because it is HE who gives you strength to succeed” says the Bible. We certainly must give it all we got when discharging our responsibilities. Our obligation to make an effort, means to give it all we got, and to never, stop trying. However, there is a big world out there that doesn’t always match with our own personal agendas. As much as we try, someone bigger and better than us, G-d, may have some other plans for the entire universe, and those plans includes the best situation for each individual. It is impossible for any one person or groups of people to control anything. We try our best and with a little help from Above we succeed. It is unrealistic to take it all on your shoulders. Give it up and leave a little room in your life for G-d in His immeasurable power to help you succeed. Please write to me with any comments rsezagui@aol.com. The Brain Rules the Heart The 'first step' of Spiritual Improvement. The Holiday of Chanukah represents the victory of light over darkness. The philosophy of the Hellenists at that time (things haven’t changed much) was to dilute the purity of faith in G-d, and the unadulterated message of the Bible, with current thinking. A small group of people, stood up to a large and fierce army, and proved a most powerful point. Miracles happen. Life, is not all logical and rational. Darkness, can be conquered, by a focused, smaller quantity, of light. This is the reason why we must light the menorah at night, towards the outside. To take the ever increasing, small, but powerful flames, and enlighten and illuminate, those who live in darkness. A person’s soul is compared to the candle of G-d. The Bible is compared to light, “The Torah - Bible is light”, and wisdom, is compared to light. Rabbi Shnuer Zalman, was a significant supporter of the Czar, against Napoleon. One of Rabbi Shneur Zalman’s followers, Moshe who was fluent in Russian and French was able to learn many important military secrets, and he was able to transmit important information to the Russian generals on the battlefront. Once, when Moshe happened to be in the French General Headquarters, the generals were making plans about their next attack. Moshe pretended not to hear or see what was going on, and the generals paid no attention to him. Suddenly the door burst open and in came Napoleon. "What is this stranger doing here?" he demanded, pointing to Moshe. Napoleon rushed up to him, exclaiming, "You are a spy!" "Your Majesty, your generals appointed me to be their interpreter, and I await their orders." His cool manner and calm voice completely disarmed Napoleon. Moshe was saved from certain death. "Rabbi Shnuer Zalman taught us, that a person should use his natural powers for the service of G-d. One of these natural powers, is that the brain rules the heart. In other words, according to the nature which G-d created in man, reason, is basically stronger than feeling; a person has the power to control his emotions. However, it is not enough for a man to know this; but he must persistently train himself to exercises this power in his daily life and conduct, until it becomes a natural habit with him. In actual practice this simply means that whenever one feels a strong desire for something, one should say to oneself, 'I can do without it.' The exercise of such self-control is the 'first step' of spiritual improvement, and having mastered this 'first step' one can steadily advance further. "Thus I have schooled myself to achieve absolute self-control, so that in everything I think, speak, and do, I let my mind rule my heart. And where it is important for the heart to express its feelings, the mind, too, must have its say, to make sure that the feelings do not get out of control. "And so I trained myself to control my feelings, not to get excited under any circumstances, and not to be overwhelmed by anyone or anybody. "And this is what saved my life." Chanukah is an opportune time for good resolutions. The Holiday of Chanukah is an auspicious time to use the light of our souls, the light of the Torah - Bible, and the light of our wisdom, to triumph over the internal, and external, darkness, which confounds our mission and purpose in this life. Thursday December 15, 2011 is the day on which the (Rebbe) Rabbi Shnuer Zalman of Liadi was freed from his severe imprisonment in Petersburg in the year 1798. False and libelous charges led to the accusations of treason against the Russian Empire, for sending funds to the Holy Land which at the time was under the Sultan of Turkey. His arrest imperiled not only his own life, but also the future of the Chasidic movement. 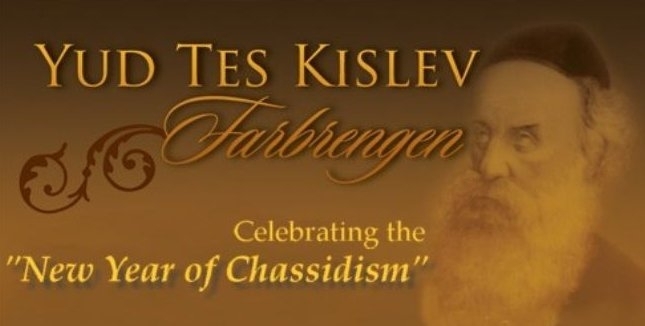 Consequently, the day of his release was declared amongst the Chassidim as a day of celebration. Chassidism was founded, to offer everyone a personal, spiritual fulfillment, by means of attachment to G-d, spontaneous enthusiasm in Divine worship, and a sanctified life imbued in joy. Chassidism reveals, that while living in a corporeal world, it is possible, to live a spiritual life. Chassidus clarifies the essence and ultimate goal of all being, man’s raison d’etre, man’s purpose in life – a meaningful and illuminated life, deeply and profoundly based on the Bible, even in a world of shadows and darkness. The Rabbi was whisked away in the “Black Mary”, a black carriage, reserved for the most serious infractions of the time. It was Friday, and the Rabbi asked the officer to stop their journey until the end of the Sabbath. The officer refused, and the axle of the carriage broke. The carriage was repaired and then, one of the horses collapsed. A new horse was brought, but strangely enough the horses where not able to move the carriage. This was sufficient for the officer to understand that he was transporting an unusual prisoner. The officer requested from the Rabbi that they travel to the next village, but the Rabbi refused and they spent the Sabbath in an adjacent field. “Do you believe” the Rabbi asked, “that the Bible is timeless, and forever relevant to every individual?” “I sincerely believe that” was the reply. “I will give you an explanation,” said the Rabbi. Czar Paul1 heard so much about this “prisoner” that he disguised himself as a clerk of the courts and went to see the Rabbi. As soon as he entered, the Rabbi rose and honored him. “You must be the Czar” said the Rabbi. “Our sages teach us, that ‘sovereignty on earth is similar to the sovereignty in heaven.’ As the fear before G-d is great, so too did I feel an unusual awe when you entered. Such a feeling I never experienced with any of the officials that have come here. Therefore I concluded that you must be the Czar.” The Czar left convinced that surely this man must be a saint. A saint indeed. The Bible tells us, that “this world conceals and hides G-d.” Truly righteous & spiritual saints, they are the windows through which we are reminded that there is more to this world than what meets the eye. There is a G-d, we can pray to, and there are miracles, we can expect. The holy Baal Shem Tov was explaining the concept of Divine Providence to his students. Everything down to the smallest particle is under His watchful eye. “The whole world is filled with His glory.” “There is no place void of Him.” They where having a difficult time, comprehending, how such a great G-d could be concerned with the smallest speck in the universe. The Baal Shem Tov decided to make a demonstration. They all went outside, and he instructed his students to follow the first leaf to get blown off the tree. As it fell to the ground, they followed it to the curb of the road. Lying underneath the leaf, was a worm being baked by the sun. The Baal Shem Tov explained, that from the six days of creation, it was already designed and predestined for this leaf, from that tree, to fall off at this moment, and be blown by the wind to shield this worm. If G-d where a finite being, little unimportant things would be less important than big and significant things. However, since G-d is infinite, whether something is big or small to us, to G-d, they both have the same impact and significance. Everything in the universe as far as their creation is concerned, has the same worth before G-d. Therefore, when a person sees or hears something, no matter whether it seems significant or not, to G-d before whom all is the same, this is being specifically orchestrated, for this person to see or hear at this moment. Divine providence, i.e. divine influence, is the root and cause of this occurrence, so that in one way or the other, G-ds purpose for creating the world at large and this person in particular, should have the opportunity to come closer to the Divine purpose and perfection it was intended and created for. In the book of proverbs, King Solomon says, “G-d prepares the footsteps of a person, and man, what does he understand of (G-ds) ways.” Every step a person takes, G-d is the one behind it, He, has prepared everything for this step to be taken, giving strength at this moment, to this person, to employ and exercise, in order to fulfill the divine purpose behind that moment. Imagine the huge responsibility! And if a person claims, it’s too difficult – There are many questions to be asked regarding the times or the place, remember the end of the above quoted verse, “and man what does he (can he) understand of (the infinite ways) of G-d.” The facts remain. What G-d intentionally placed on your plate, this is precisely what is right for you at this moment. Although, everything inherently has equal importance before G-d, however because G-d proclaimed, I will favor those who follow my dictates, this person becomes more prominent in the eyes of G-d for blessings and favorable attention. The five types of personal tests. We have here a very clear understanding. Challenges are presented to people for their, own good. When G-d wants to provide merit to a person and help him, reveal his inner better and superior core, that is when the person is put through a test. If you where to go to a Doctor in whom you have full trust, and he where to put you through some procedure of pain and difficulty, knowing that it is all for your own good, to improve your current situation, you welcome the opportunity. You accept and you open your arms to the chance granted, to recover and become better off through this experience, than you are at this present moment. According to the Bible, all of life, is a constant tug of war. On the one hand, to do what G-d expects of us, and enjoy life through His blessings, and on the other hand, the temptations and weaknesses, that pull us down, in the opposite direction. There are five tests the Bible speaks of. There is the test of self sacrifice. No matter what happens, or what anyone says or threatens, to do to me, I am completely and totally dedicated to the proper G-dly morals and values, with all my body and soul. The next type of challenge and test, is to accept all types of life happenings, even the difficult ones, in love. I don’t complain about my circumstances. My faith in G-d is so strong that I accept everything in love. The third type of test. When life is abundant and I am feeling real good and healthy, I am successful financially, personally, do I still remember G-d, and not only keep up with my commitments, but increase them in gratitude to G-d, for entrusting me with all those blessings. The fourth type of challenge is a most difficult one to overcome. Our sages tell us, “who is strong, the one who overcomes his inner temptations.” When faced with a strong desire in opposition to what’s right in life, the wishes of G-d, how often and how quick am I, to ignore the lure and enticement pulling me to do, what I know, is wrong. The fifth type of test. When things go wrong, life is not as I would like and not as I expected, does it weaken my faith. Is my confidence and conviction, that all that happens is from G-d, and for my good, undermined and destabilized? Life’s tests are very difficult. The Bible acknowledges that. They are thorny and not easy, not just mentally and emotionally, but as well physically. Many times, it will, exact a high price on us. However, once we draw the inner strength to overcome, and we look back, we see how much better we have truly become. Always. Not only that, the satisfaction, strength, confidence and self esteem that comes as a result, doesn't compare, to the fleeting and transitory hardship it took, to triumph over the challenge.